Close your eyes and imagine you’re strolling down the posh and fashionable Via Monte Napoleone in Milan. From a storefront, a glint of gold catches your eye. There, beyond the window you see an intricate chain of shining gold, balancing Byzantine and modern design with the kind of panache that can only be achieved by Italian artisans. You smile, thinking how happy she’ll be when you surprise her with something so beautiful. Then, you see the price. Your sweet dream is quickly turning into a nightmare. That’s where we come in. 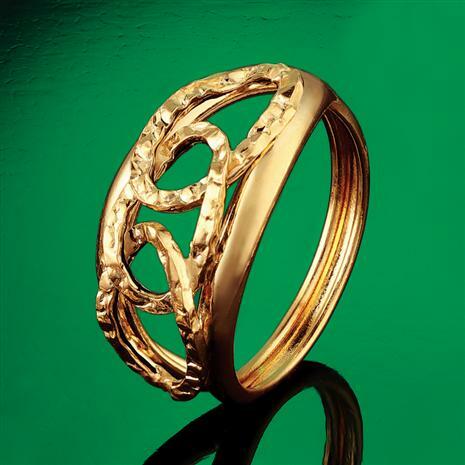 There is no doubt that Italian gold jewelry, with its sensual beauty and extraordinary craftsmanship, is world renowned. This also makes it quite expensive. Which is why we have dedicated the last several years to bringing the very best in Italian design to our customers at extraordinarily affordable prices. We found an Arezzo-based company that has spent generations perfecting perfection. The Sogni D’Oro Collection is proof of their success. Fashioned of 14K gold links arranged in a graduated style, this necklace exudes a luxe look while being incredibly comfortable.